On top of the ammo in the autoloader is an armoured plate so any penetration of the crew compartment sending a shower of sparks and hot metal fragments will not reach the ammo in the autoloader. Good photos of T-72B1/3 in service. Just scroll through the thread! I still can't get used to the weird ERA placements on this tank. Yeah its weird, other stupid thing is the non-automatic sight cover. T-72B4 as we know will add the commanders panoramic sight (same as T-90MS) as well as battle management systems. I think we had that picture posted here already about T-72B3?!? Yeah that is an older pic, not the exact same T-72B3s. The Ground Forces received more than 250 T-72B3 tanks in 2013. I have to say, it is not a bad figure, at all. Now if they would work out the last kinks of the B3....without increasing price too much...well we will see with B4 next year. Excellent. Thats more than I thought. 20 more T-72BZ ??? what is this? Bad translation, but 20 more B3 yeah. Hmmm, 270 seems really high considering the kind of contracts I saw UVZ looking at several years ago (330 tanks over 3 years or something). Maybe it includes missed deliveries from 2012, who know. Some overhauled T-72Bs were delivered to units operating T-80B, but they were not fully upgraded to B3 standard. I have a feeling the Colonel included these in the numbers...but I could be wrong. Will be very intersting to see how many follow up next year. I need to add up all T-72B1, B3, BA numbers one of these days. Good news, I also hope they will modernize part of their T-72 to BMPT-72. So first contract was in 2011 was for 170 T-72B1 modernizations. In 2012 another contract warded for 360 modernizations (all B3, maybe?) by 2015. The timescale is confusing, I guess it is feasible that many were done this year....looks like they are hurrying T-80s into the reserve by taking out T-72s from reserve and capitalizing or modernizing them. New T-72B3 in the 20th Army of the Western Military District. 100 T-72B3 is transfered to Russian Army today thus finishing state defense order for 2013. "To enhance the combat potential of the combined arms formations and units of the Land Forces troops re-completed with T-80 tanks T-72. 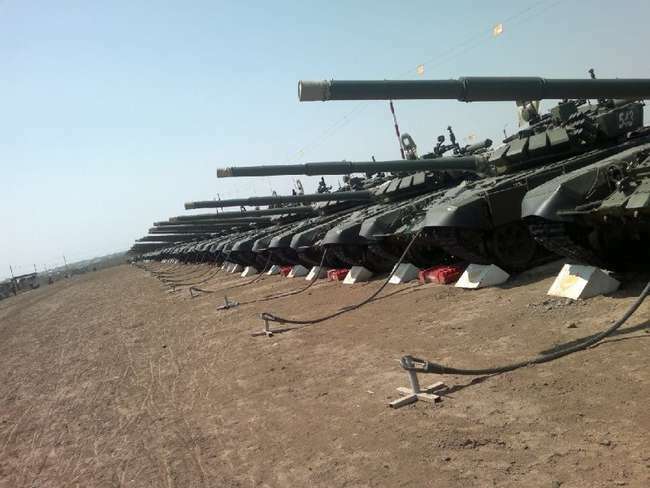 To this end, the troops were delivered more than 1,100 T-72 tanks, including after extensive modernization, which increased share of modern machines tank park "- said Bulgakov. Viktor, there is no way that number is modernized T-72s. The upgraded numbers are still around what we estimated before, this is just Mod and reporters confusing everyone. However if that figure is anywhere near reality (could be, they started en masse several years ago) then the T-80s future in Russia is numbered indeed. Sorry but the replacement of T-80s with upgraded T-72s is not a downgrade. The autoloader of the T-80 is fundamentally flawed and despite better armour with the new communications/thermals/guns and ammo/battle management systems the upgraded T-72s will have longer sight, better communications and better hitting power and at the same time will be much safer for the crew. hmm, why dont they just refit the tanks with T-72 autoloader? afaik t-80 hull is slightly wider than t-72/90 hull. The T-64/80 might look similar to the T-72/90 but they have completely different components. Why spend money on the T-80 to make it more like a T-90 when you have lots of left over T-72s that are compatible with most of the upgrades applied to make the T-90? GarryB wrote: Sorry but the replacement of T-80s with upgraded T-72s is not a downgrade. It is more vulnerable in an urban scenario yes, but that is not to say the T-72 is proof from side penetrations detonating carousel either. Just less likely due to lower profile, and the bigger wheels (compared to T-80) covering up the hull sides. Mind you most tank units in Russia are not supposed to do urban combat anyways. Hell we could make an argument the new K-5 armored T-72B3s are worse for urban combat than good old T-72B due to the better all around K-1 coverage! The T-80s autoloader is a bit faster loading as well, an advantage in tank-vs-tank combat. Regarding downgrade, Kapremonted T-72 does not offer everything a T-80 does. Remember, I am not talking about B3, but simply overhauled T-72Bs. 1.) Fire control. T-80 has a system, T-72 basically does not aside from rangefinder. 2.) Mobility. To make situation worse supposedly some T-80s received GTD-1250 upgrade, the disparity obviously becomes even worse. I am not even going to talk about the T-80U conversions that were made until recently (T-80U turret on top of T-80B hull). Obviously the T-80 will have higher fuel consumption, but that is the price you pay for such a drag racer of a tank. The T-72B3 does have the obvious advantage of K-5, new gun + ammo, Sosna-U, but mobility wise it has nothing on the T-80. collegeboy16 wrote: hmm, why dont they just refit the tanks with T-72 autoloader? afaik t-80 hull is slightly wider than t-72/90 hull. MOD wants to get rid of T-80s, due to rejection of gas turbine. The T-80s autoloader is a bit faster loading as well, an advantage in tank-vs-tank combat. The upgraded T-72s will have new guns with new design autoloaders... we don't know how fast they operate but we can assume they are rather more powerful. The point of choosing the T-72s over the T-80s is so that the B3 upgrade can be properly applied to them fairly soon if not right away. Fire control. T-80 has a system, T-72 basically does not aside from rangefinder. With the upgrade the T-72s will have better FCS and thermals than the T-80s had. The T-72 doesn't have bad mobility and the cost in terms of fuel consumption and enormous IR signature are very undesirable... the IR plume of a gas turbine is impossible to mask. And to have one tank family in service. They allow for longer rounds, but I have seen nothing to suggest they are any faster in operation. But most of the T-80s are replaced by nonupgraded T-72s, so they don't even have that going. That is assuming they all even get T-72B3 upgrade...this is over 1 thousand tanks we are talking about. To put it mildly I am not holding my breath for all of them to be upgraded, and in any case it will take several years. Until then, its a downgrade. Well yeah T-80B did not have any thermals, but we are back to the non-upgraded vs B3 circle. Given how big the T-72 fleet is now (with the replacement of ANOTHER 1000+ tanks by the T-72, not including the well over 1000-1500 T-72s already in service I don't think the prospects are exactly inspiring. Plus let's not forget B3 includes a major kapremont, so they won't be sending back T-72Bs that have been recently overhauled into upgrading at least until the service life runs out again. T-72B is considered a bit underpowered by the army, the difference is pretty substantial when compared to the T-80. B3 does nothing to improve this this MOD cheaped out on the engine. Absolutely, but I think this is a backwards step. T-80 has spares all over Russia, and training facilities as well, they could easily have been kept in service till both it and the 72 are replaced by new tanks. There are a number of excellent T-80 upgrades as well that the MOD shelved. I don't think the units exchanging their T-80s for T-72Bs are going to be too happy about it.